Pollution and the Marine Environment: An English Channel Perspective. Scientific and Public Engagement Event, September 2014. Professor Awadhesh Jha: Convenor, Chair of the Scientific and Organising Committee. Session on Eco-genotoxicology, 43rd Annual Conference of European Environmental Mutagen Society, Lancaster University, UK, July 2014. Session Organised and co-chaired by Professor Awadhesh Jha. European Environmental Mutagen Society (EEMS) Programme Committee, 2013-214 (for 43rd Annual Conference of EEMS), Lancaster, July 2014. Professor Awadhesh Jha: Member of the Organising / Programme Committee. International Symposium on Environmental Radioactivity, Plymouth University, 3-5 September 2012. Professor Awadhesh Jha: Main Organiser/ Convenor. 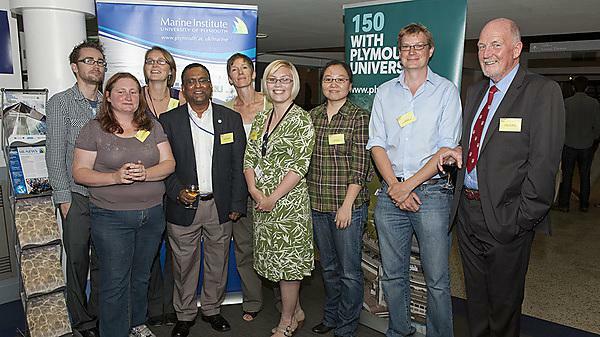 Members of the group organising international symposium on environmental radioactivity at Plymouth (2013).